Gosick 19 begins a new arc, and at first things look like the intensity of recent arcs has vanished, as we are presented with the beginnings of a Christmas-themed episode. Kujo is off to buy his girlfriend a present, and the city of Saubreme is full of holiday bustle. Of course these pleasant scenes don’t last long long. Falala la la, la la, la, la. 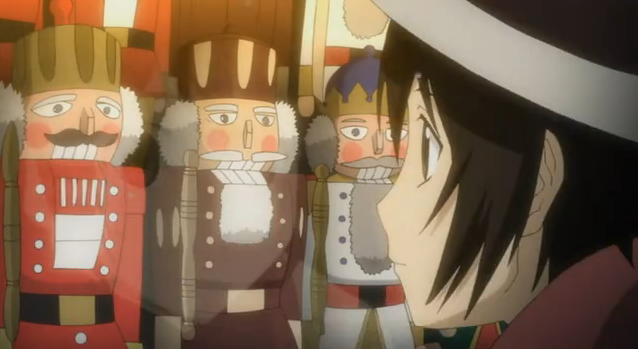 In fact, Kujo really wants to buy Victorica a present because Christmas turns out to be her birthday. The streets of Saubreme are lined with merchants selling gifts and holiday wares, there is also a special performance of the Blue Rose, a story related to the royal family of Saubure, and a surprising number of soldiers. Through Cordelia’s flashbacks we get the story of Victorica’s birth, and it turns out to be extremely grim. As a young girl, Cordelia was abducted by Albert de Blois, and raped. When the child was due, she was chained up, and the child was removed as part of an occult ritual. Cordelia escaped later, with the help of Brian Roscoe, and eventually returned to give her daughter the locket she carried early in the series, to give her hope, and so that she would know of her mother’s love. As we already knew, Victorica was then raised in captivity by the Marquis de Blois. Yet with the woes of sin and strife, The world hath suffered long; Beneath the angel-strain have rolled, Two thousand years of wrong; And man, at war with man, hears not, The love song which they bring: O hush the noise, ye men of strife, And hear the angels sing. So what began seemingly as a pleasant Christmas-themed episode, becomes ever clearer a major arc, with all of the major actors in play. Cordelia sends a warning to her daughter that the winds of the Second Storm are picking up, and Victorica tries to locate Kujo, who we know has left the Academy to buy her a present in the city. Greville appears and takes Victorica away. Have Victorica and Kujo been separated for good? For his part, Kujo seems to realize something is amiss. He sees the unusual number of soldiers, and seems to understand that to stay by Victorica’s side, he is fighting against fate. I still have hope that Victorica is being brought into town so the couple can reunite. The Marquis de Blois is orchestrating the Christmas performance of the Blue Rose, and is also the one who demanded Greville use Victorica to solve Saubure’s oldest unsolved crime (which is the story of the Blue Rose). I suspect we will get more detailed information about the Blue Rose (and possibly a sample of the performance) in the next episode. The setting of this crime, however, is described at one point as a country home, so I am not sure where Victorica is being brought. With an expected 24 episode run, Gosick seems to have one more arc, beyond the resolution of this one, and yet this arc already has the feel of major importance. Details presented early only now reveal their full importance, or take on deeper meaning, all of the major characters are involved, the mystery at the center is directly related to the royal family, and the appearance of soldiers in the street is a clear foreshadowing of World War II. By this time, Mussolini and the fascists had already risen to power in Italy, and Hitler was writing Mein Kampf from his jail cell, following his first, failed, attempt to seize power. 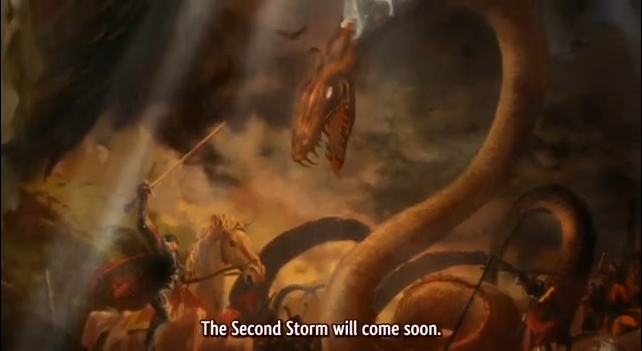 The winds of the Second Storm are, indeed blowing. Well, that was a disturbing episode. So, it turns out that the whole line about Cordelia being banished because de Blois found out about her “crime” was an outright fabrication. One has to wonder if even Greville knows the whole truth. His loyalties certainly seem divided. 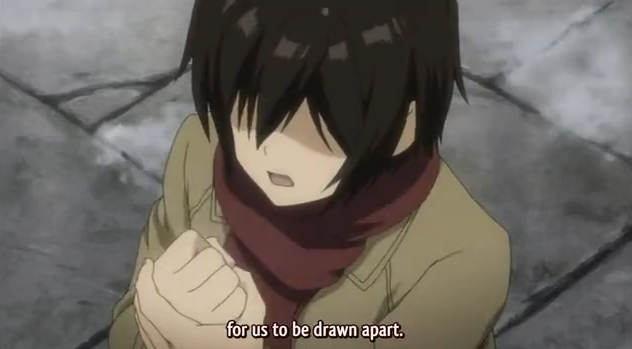 I don’t believe his telling Kujo where Victorique was being held in the previous arc was part of Daddy’s plan. It’s also interesting that Cordelia had previously met Lee – the girl who executed the Oracle from the first episode – during her stay at the sanitarium. Nothing more than coincidence? The motorcycle also couldn’t help but remind me of the earlier beheading. I wonder if some of those previous “unrelated” incidents might yet turn out to be part of a greater whole. That would be cool! That wasn’t Lee; that was Julie, the one who orchestrated the whole haunted ship thing. I’m going to have to re-watch that arc now. Names are the things I’m worst at remembering. For some reason I always assumed something much tamer happened between Albert and Cordelia, maybe a marriage of convenience, or seducing a chambermaid. To see that he abducted and raped her fits his personality as developed in recent arcs, but was still quite a shock (to me). 109: I guess I disremembered who gave who the locket when (I watched that episode a while ago), but it’s still interesting that the two encountered each other. One has to wonder if there was any further contact between them after they got out. Joojoobees: I’m pretty sure that when we first heard about Cordelia the implication was very much what you seem to remember; that there had been some sort of assignation between Cordelia and Albert, and that he had only broken it off once he learned about her supposed “crime” back in her home village. I’m going to have to go back and view those episodes again, but I think this was the story Victorique told, and so it’s probably what she’s been lead to believe. I could never understand why Cordelia would simply leave Victorique behind, but now it’s clear that she had no choice in the matter. Albert needs to die hard. He is, seemingly, beyond redemption. The scene of him as a young kid trying to get Leviathan to create a homunculus army was very revealing. He doesn’t think anything he does is ever wrong, though likely he believes his ends justify all his means. Yeah…the worst atrocities are always committed for the noblest of purposes.